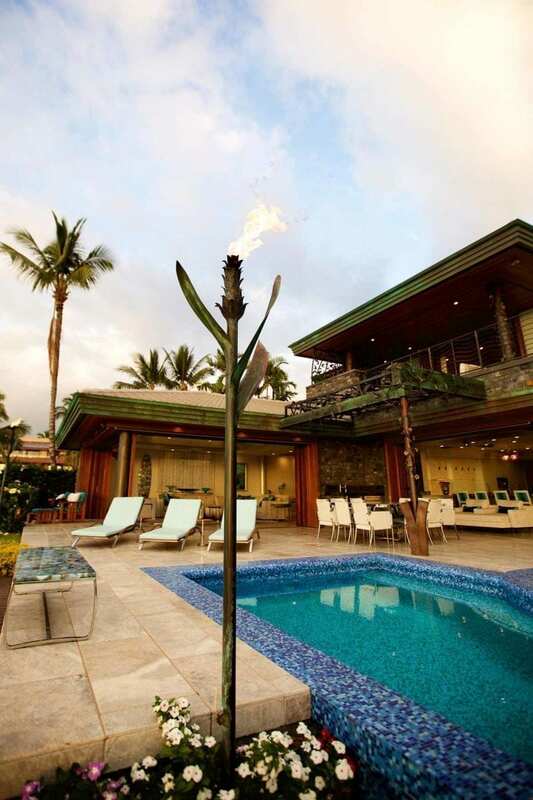 Detailed and full of flavor and life! 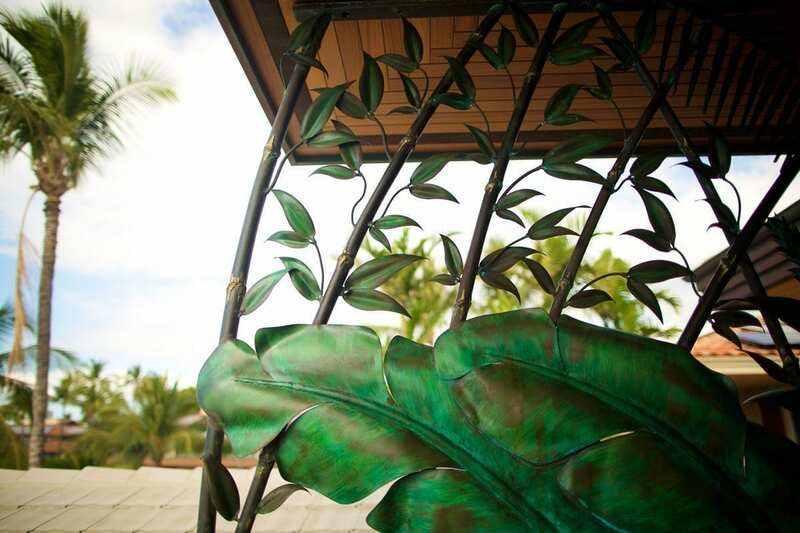 This project is layers of custom metal sculpture with intricate designs and details. 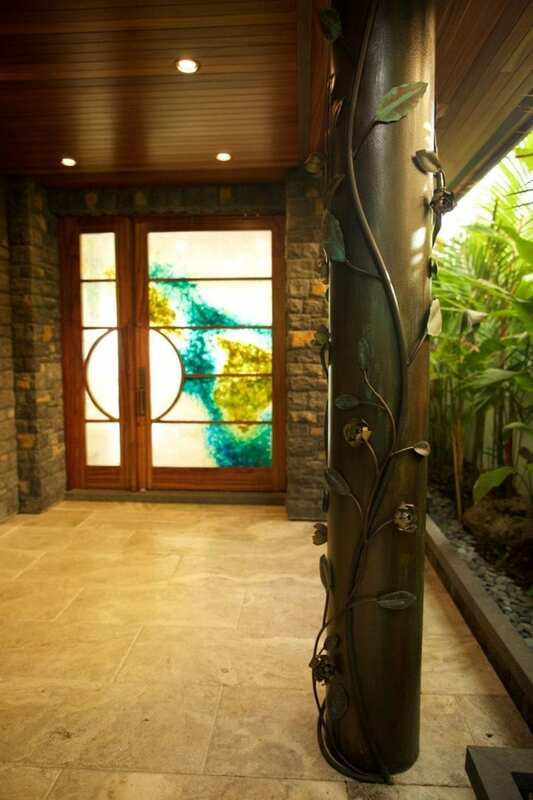 The rainforest canopy is silhouetted against the night sky. 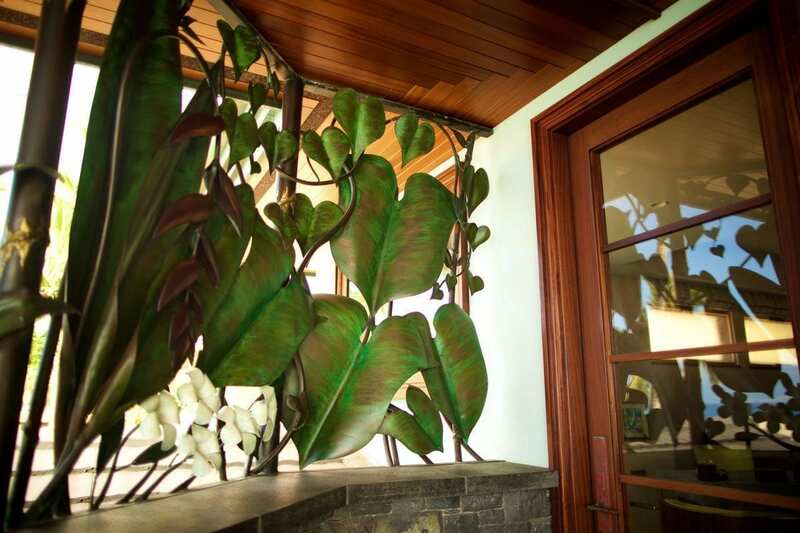 The columns are clad in textured copper and then wrapped with a sculpted flower vine from floor to ceiling. 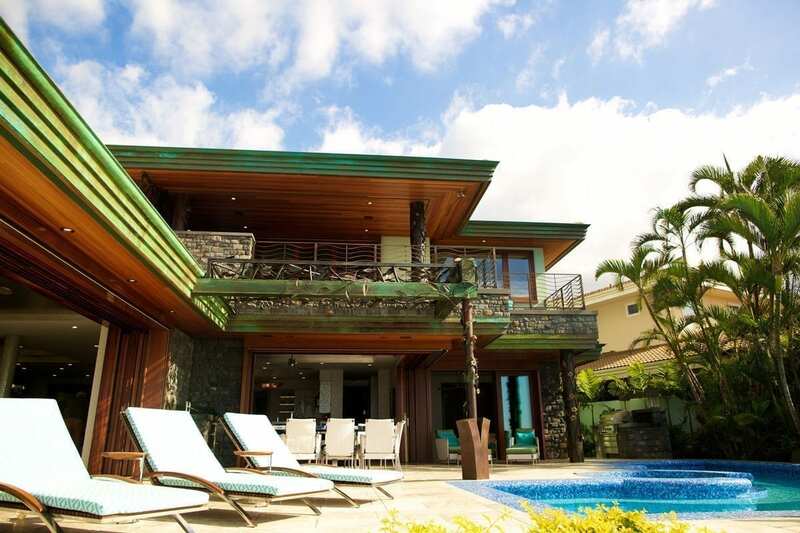 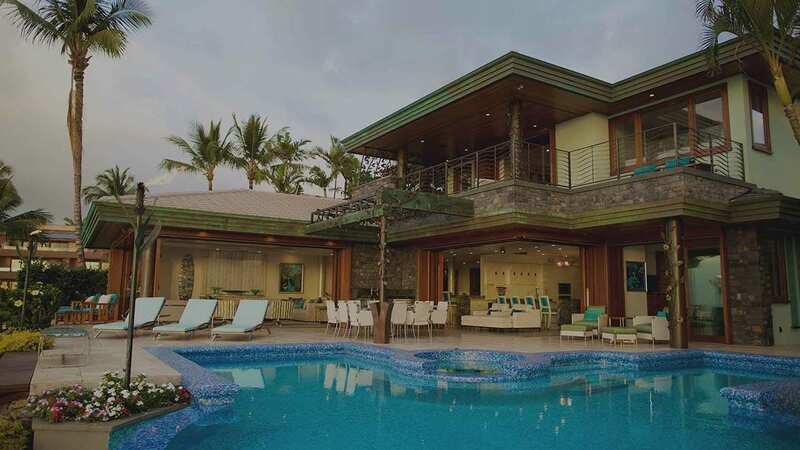 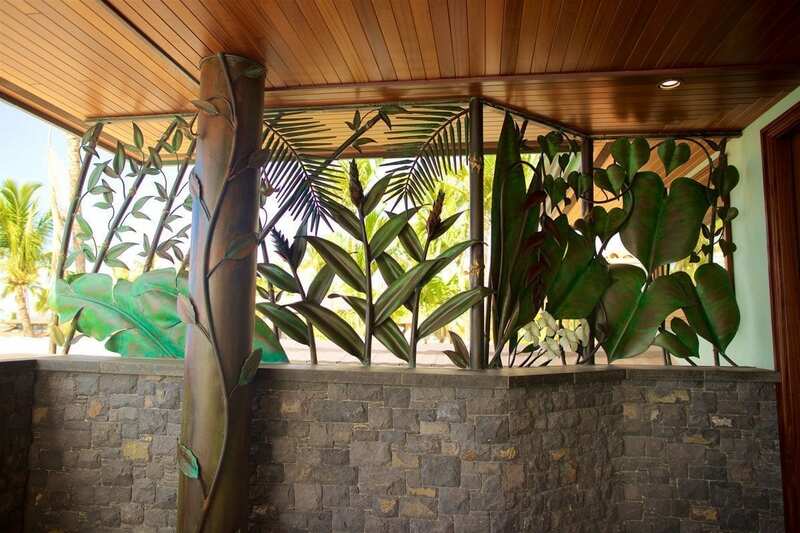 The sculptured partition on the upper balcony was designed to add privacy to the master balcony and at the same time create a taste of the tropical plants and flowers. 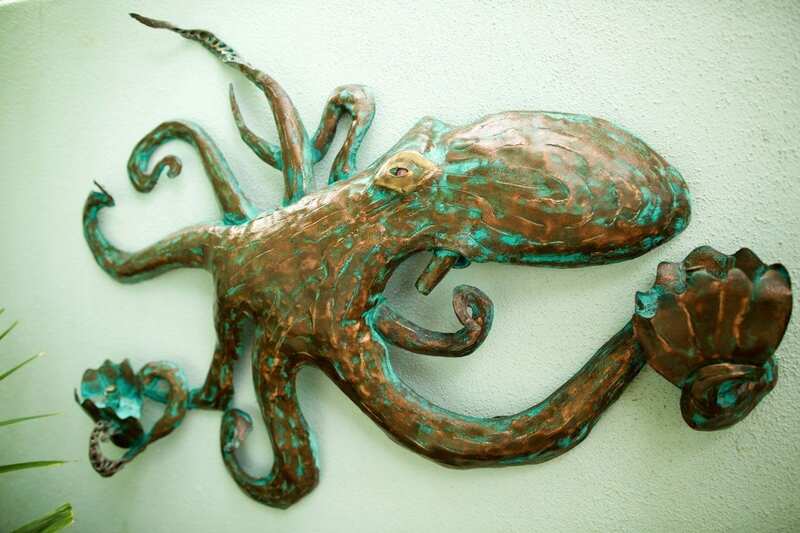 This piece was fabricated from copper, brass and bronze and finished with layers of beautiful patina. 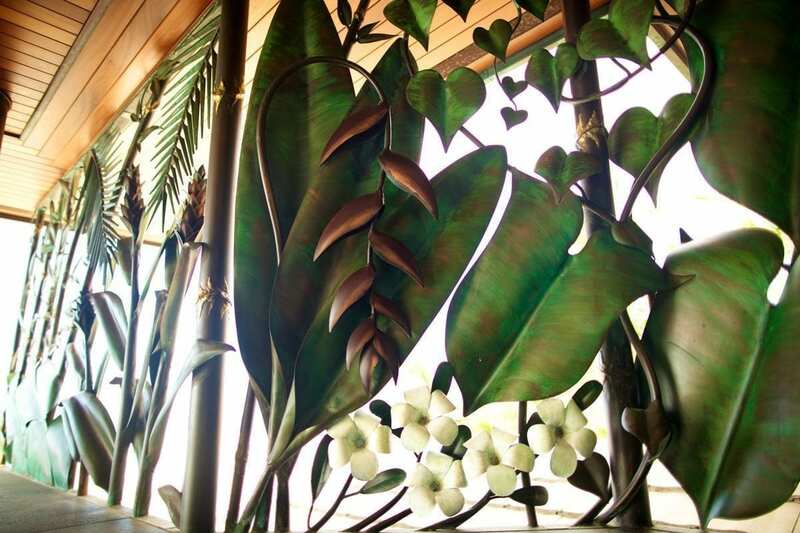 Solid brass construction with Padilla‘s signature current pattern. 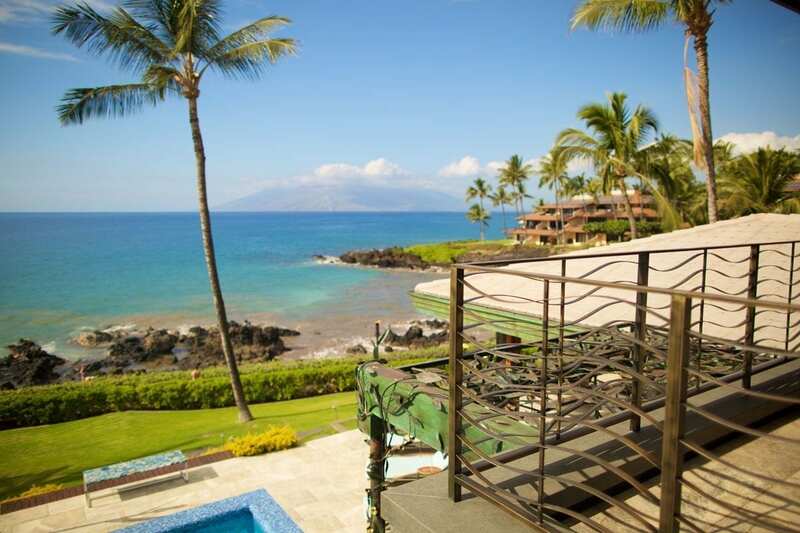 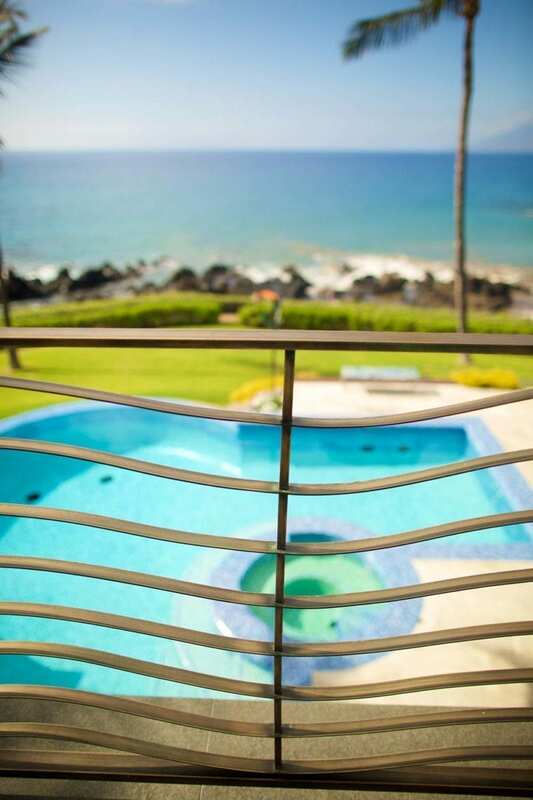 This Railing maximizes the ocean view and adds a delicate and durable architectural element. 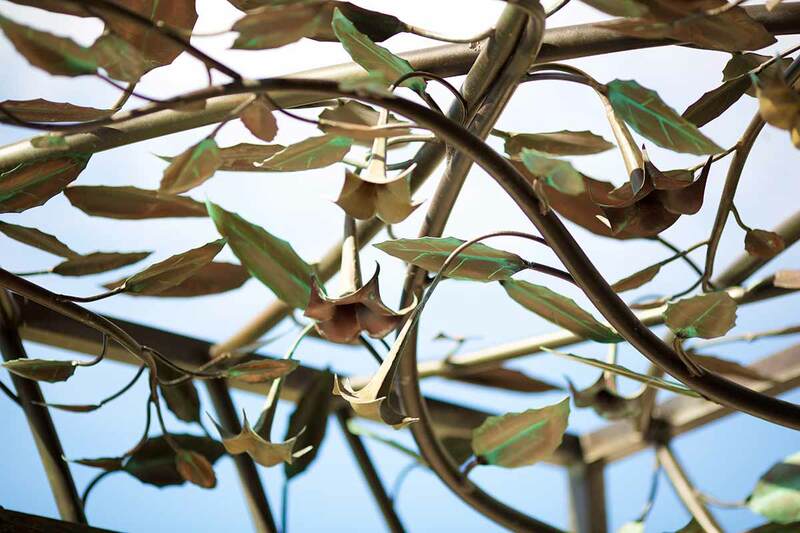 Hundreds of leaves and flowers create this rainforest canopy of beautiful silhouettes and colors. 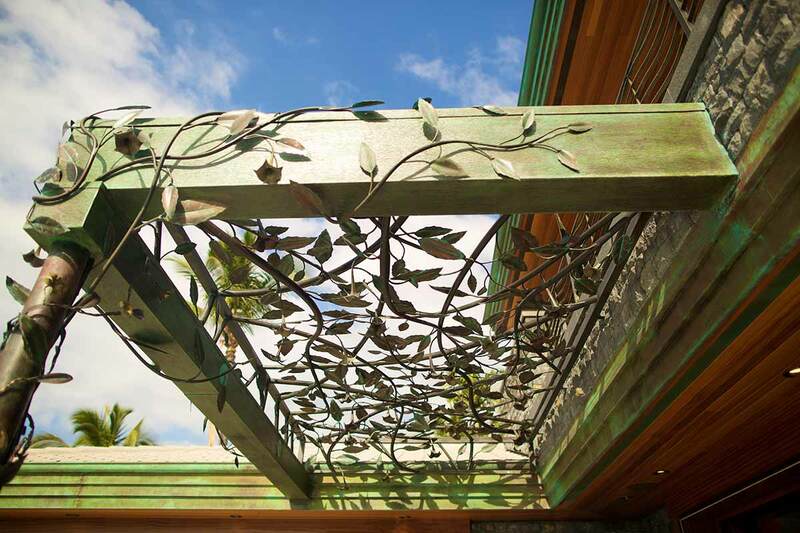 The surrounding beams were clad in textured copper and the trumpet flower vines are growing around the beams twisting and turning as if they grew right in place. 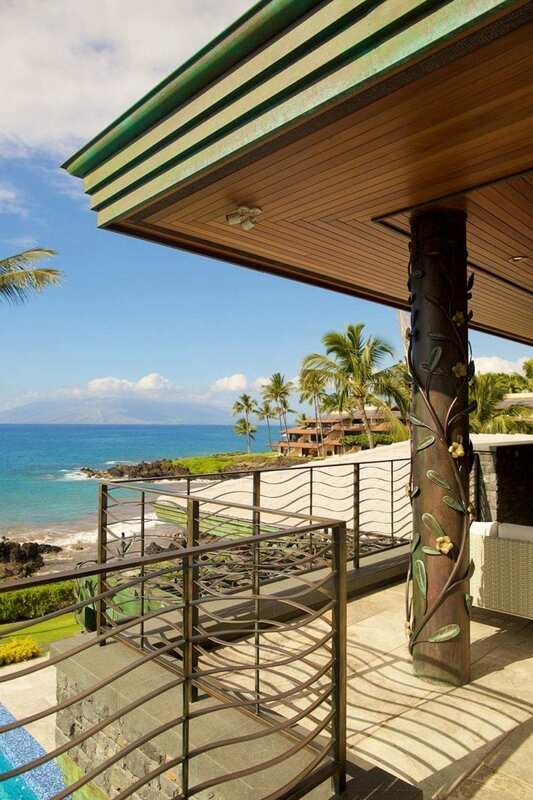 The seven supporting columns throughout the property were always in view and needed something special. 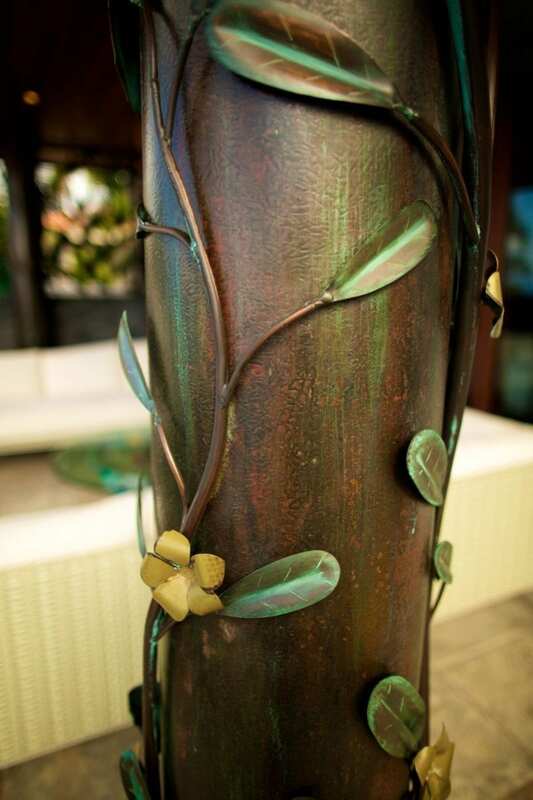 We designed a layering process of textured copper and covered the seams with a series of sculptured flowers and vines. 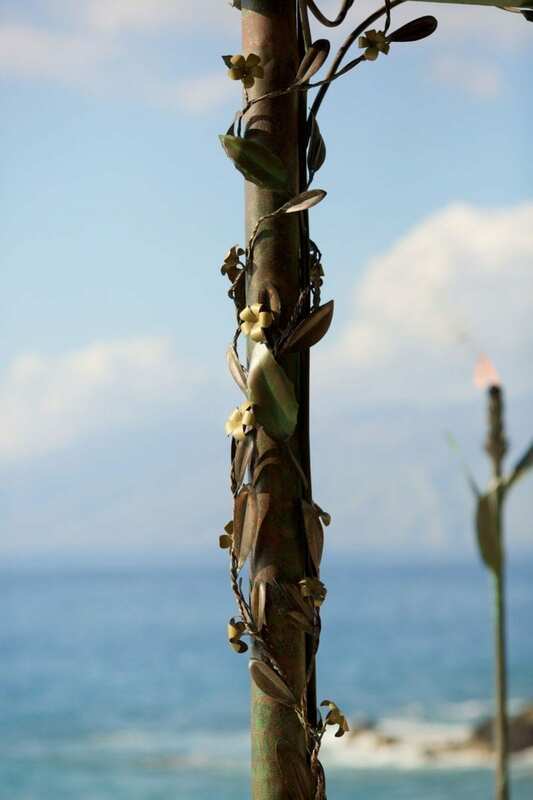 Gardenias and plumeria flowers will always be blooming on these sculptured columns. 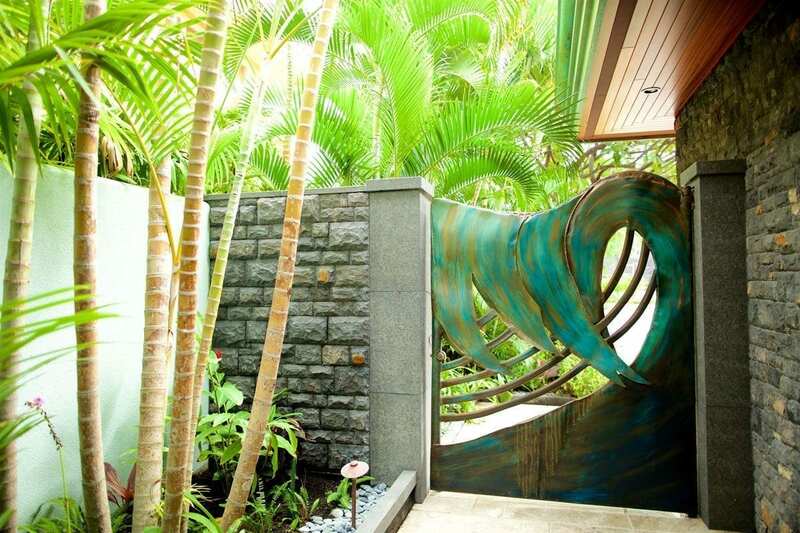 To tie the property together a series of functional and decorative sculpture was incorporated into the hardscapes. 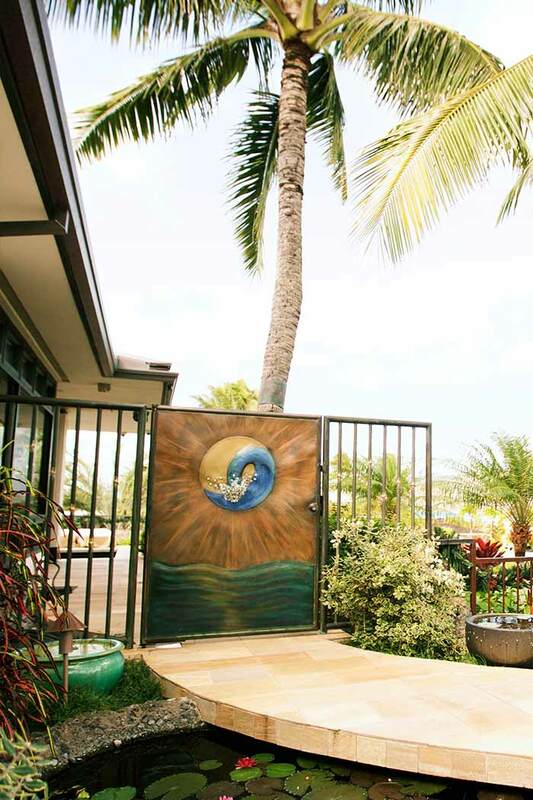 From the brass and copper wave entrance gate to the ginger tiki torches and unique tako wall sculpture. 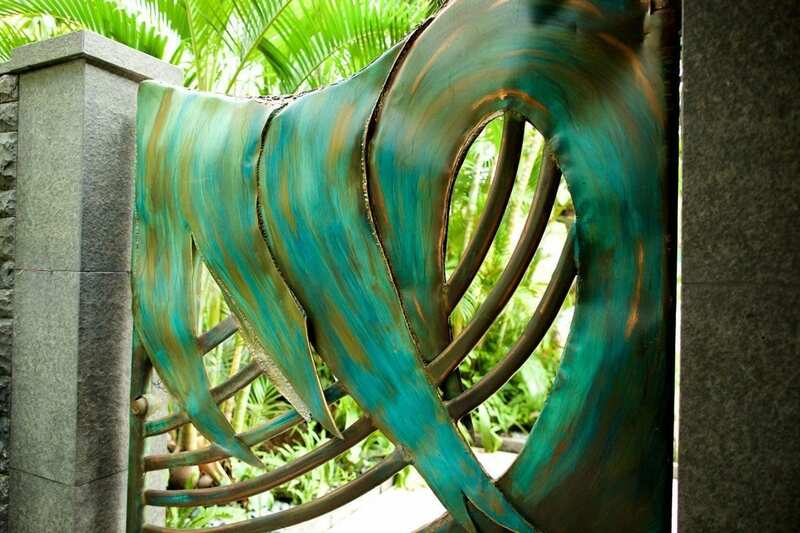 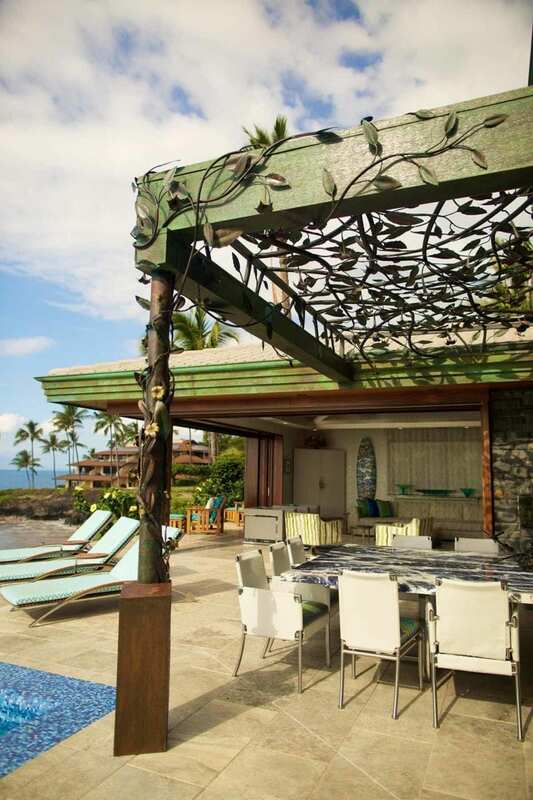 These features weave the metal sculpture theme throughout the property. 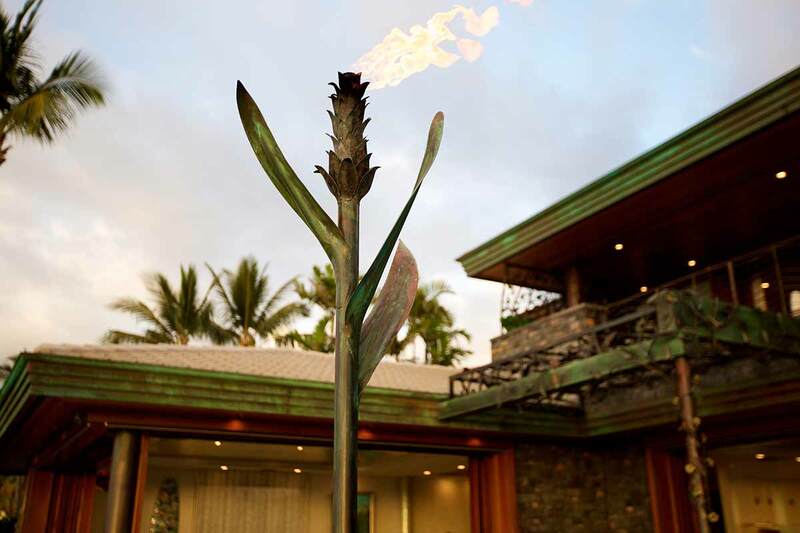 From a sweeping spiral staircase and a hibiscus ceiling sculpture, to a volcano fire feature and butterfly pedestrian gate, our work is woven throughout the property to add beauty ambiance and function.